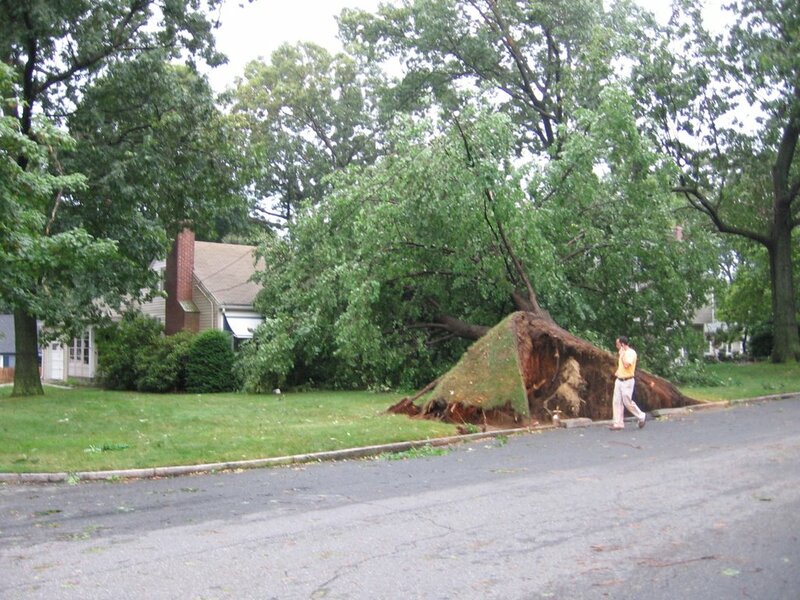 At about 5:30 pm on Wednesday a severe thunderstorm rolled through my neighborhood. It was brief, but boy howdy, was it intense. The weather folks are estimating that the winds were 80+ mph at times, and there may have been a microburst. There were power lines and trees down all over my city and two nearby towns, leaving almost 20,000 people without electric power, but the town five miles south of here only lost one tree. 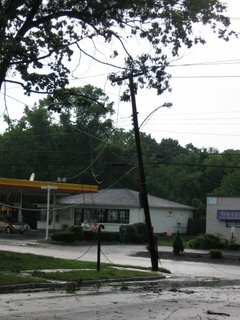 See how the utility pole is leaning a bit crazily to one side? 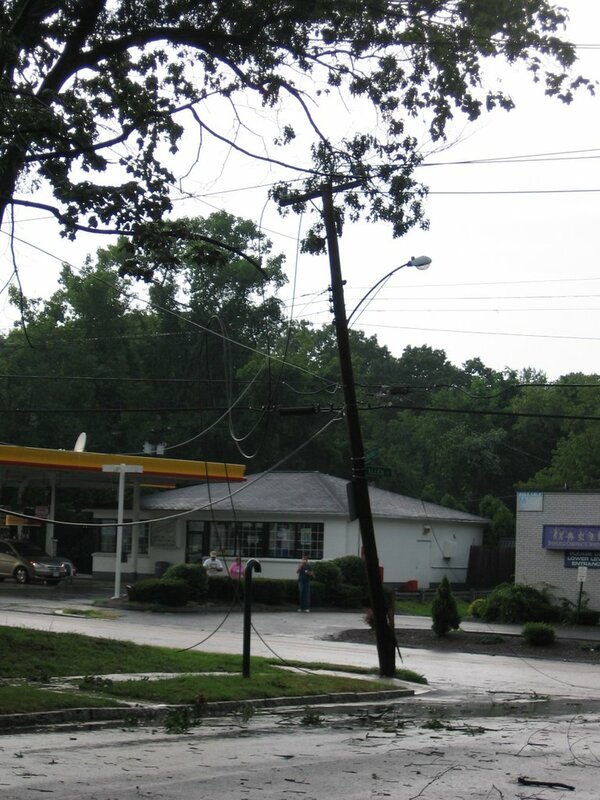 When the huge limb fell on the power lines, the lines yanked the pole partway over, cracking it almost completely. Then the lines snapped with a huge ZZZTTTT! and an eerie flash of green light. In the meantime, there were similar sights and sounds at the other end of my street, where the top of one utility pole snapped off entirely, dropping a transformer into a shattered heap on the sidewalk. When the storm first rolled in, it seemed like a "regular old thunderstorm", and so I was puttering around the house doing my usual things while the girls played upstairs. Then I happened to look out the back door and realized that the rain was coming, um, sideways, and that the tree limbs were swinging crazily. So I ran to the front of the house to get a better look, just in time to witness the fabulous light show noted above. After that I ran upstairs in a panic to get the girls and move them to the basement. By the time I was back downstairs with them, the storm was mostly over. And the sun came out! And all my neighbors wandered out of their houses to view the damage. It was like a neighborhood block party, without the snacks. 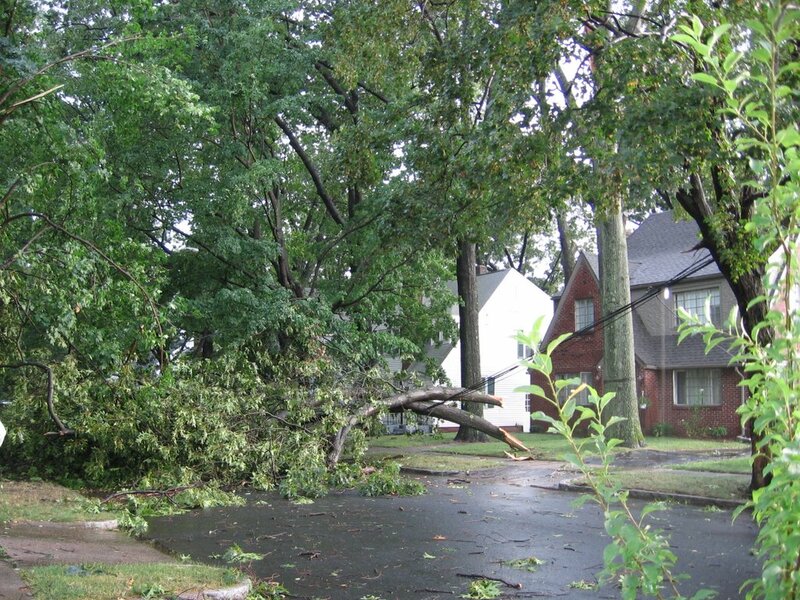 Amazingly, neither our house nor our cars were damaged at all. Even the garden came through unscathed. At that point it was clear that we would be without power for quite a while. And it was hot. Hot as in mid-to-high 90's, with high humidity. Pretty much the hottest day of the summer. Let's just say that it was a LONG, sweaty night, punctuated with the sounds of sirens and utility trucks and chainsaws. About 1:15 a.m. I heard another ZZZTTT! noise and I sat bolt upright. The window shades were up and I could see all the lights go on at the service station on the corner, then go out again a second later as the sky behind the station lit up with green flashes as more tranformers blew out. The security alarm at the convenience store went off four times (about five minutes each time) as the street filled with fire trucks and police cars. Police officers wearing bulletproof vests were patrolling the street, waving around huge flashlights and talking in loud voices as their radios crackled. It was a bit surreal, like looking out onto a war zone. Thankfully, I don't live in a war zone. I am lucky enough to live in a country where we talk about the return of electric power using the word "when" instead of "if." On Thursday I spent the day at a friend's air-conditioned house, driving back home every so often to see if there was any progress. At one point there were five cherry-pickers, one haz-mat truck (to deal with the PCB's from the shattered transformer), and two police cars on my tiny street. By 6pm our power was restored and life returned to normal. Did I mention that this was my vacation week? And that I was sick with an evil cough and hardly slept all week prior to this event? Yeah. I was really fun to be around, let me tell you. Final photo--taken near my friend's house a few blocks away. I hope I don't experience another storm like that ever again. I can't imagine ever having to ride out a hurricane!